The night that I gave my first BBQ lesson lines up almost perfectly with when I started going down the rabbit hole that is the BBQ scene. I’d just been made redundant from the best job I’d ever had and decided to take the family on a camping trip to clear our heads in the couple of weeks between when I finished up and when my wife went back to work full time. To this end, we packed up our poor, tired old Commodore and whipped her all the way from the Gold Coast down to Newcastle in New South Wales. We set up our tent just behind the sand dunes at Stockton and set about shaking off the experience and connecting as a family. I was in charge of cooking the meals, as I am when we are camping and grabbed the esky with the ingredients I’d bought at the supermarket earlier, and the box of cooking gear and headed over to the communal BBQ area. The BBQs were the old style electric ones with the stainless steel cooktops, and not my favourite thing to cook on. However, I set about cooking up a delicious, balanced meal for my family. On the BBQ next to me was a Dad cooking up dinner for his three kids. It was his annual holiday time with his kids and so we struck up a conversation about how good camping is for bonding with them. It wasn’t long before he started looking over at my hotplate and looking back at his own hotplate that just had some supermarket sausages and onion on it. 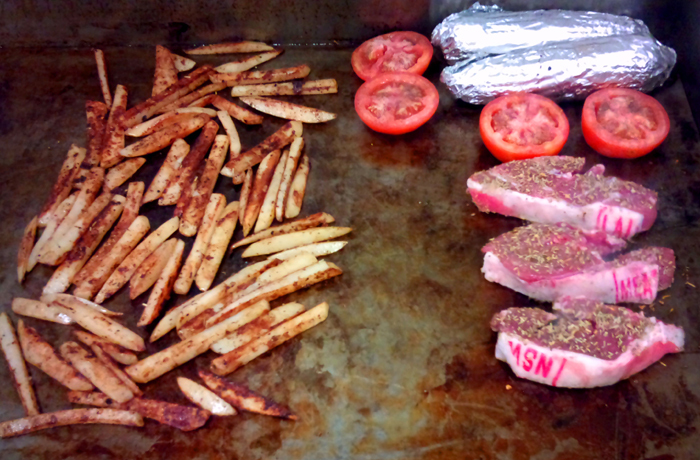 My own hotplate had seasoned lamb chops, french fries, corn on the cob, and tomatoes. I think it was the smell that got him. It wasn’t long before he asked me how I did it. And so that was when I set about explaining about the different foods, the spices, and how to time everything so it all came off the grill together. To his credit, we met up at the kitchen the next night and he had some tomato halves and french fries to add to his sausages and onions. His kids were very impressed and he was obviously very happy that he was getting this kind of respect and attention from them. I was really happy to see that I’d made a difference to this man’s experience camping with his kids. I think that this experience has led to my developing this website: I want to help people everywhere get more out of their grill and experience the kind of bonding and interaction with loved ones that occur when you cook for them. When have you had a great bonding experience around a BBQ? Let me know in the comments below.